Wi-Fi 802.11ac wireless, Bluetooth*, and 7.1 surround sound..
NUC NUC5i7RYH Wi-Fi 802.11ac wireless, Bluetooth*, and 7.1 surround sound.. Equipped with a 5th generation Intel® Core i7-5557U processor, NUC5i7RYH is the highest performing Intel NUC ever. Iris graphics 6100 delivers amazing multimedia experiences and makes NUC5i7RYH perfect for immersive gaming. A replaceable lid provides plenty of options to extend system capabilities or add personal style. Intel® Turbo Boost Technology 2.01 delivers performance that adapts to your needs. Add a 2.5-inch HDD or an M.2 SSD for more storage. Complete with Wi-Fi* 802.11ac wireless, Bluetooth*, and 7.1 surround sound, NUC5i7RYH is ideal for home theater PCs, media server PCs, and home hubs. 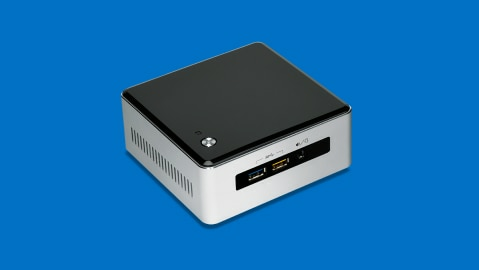 To Recieve updates and possible rewards for Intel NUC Kit NUC5i7RYH please sign in. To Recieve updates and possible rewards for Desktop & Mini PC please sign in.